Alex Jones has a serious conspiracy theory about the film "Alien: Covenant" -- and it's not that it's going to be a huge hit. He says it will explain the secret mission of a global elite that is trying to enslave the human race. 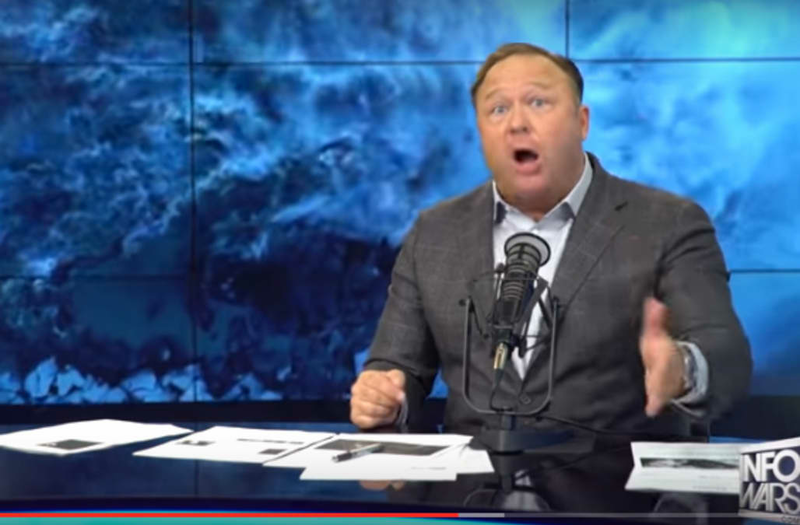 Jones, who hosts "The Alex Jones Show" on the radio and owns the website InfoWars.com has been called "the most prolific conspiracy theorist in contemporary America" by the Southern Poverty Law Center, which tracks hate groups. The 14-minute rant, he explains how his conspiracy about "Alien: Covenant" fits in with his philosophy. According to Vocativ, his guiding theory is that "globalists" operate through a secret society called the Illuminati while trying to build a "New World Order" in which the "super race" rules over all humans. The Illuminati is made up of world leaders, business authorities, innovators, artists and other influential people. Jones explains in the video that "the globalist, the social engineers that run this planet" reject the theory of evolution in favor of direct panspermia -- the theory that organisms were planet on Earth by an extraterrestrial race. In the video, he explains the Illuminati are inspired by that race, and thus are trying to take over human evolution. "(They) are turning the entire planet into a petri dish where they are testing on the population... to create these new super creations," Jones says in the video. So how does this tie into a Ridley Scott movie? After viewing the trailer for "Alien: Covenant," Jones said he thinks the director is revealing the globalists' strategy. "Ridley Scott admitted that basically the ship was a weapon carrying bio-mechanical creatures that were used for war by advanced species," Jones says in the video. "This is what the globalists are now admittedly currently building. The entire 'Alien' franchise is a revelation of the method." "Alien: Covenant," which is the second prequel to the Alien series following "Prometheus," shows humans exploring a planet that seems to be paradisiacal. Jones says it is not what it seems. He claims it's a "giant test tube merging plants and animals in bizarre new forms -- a religious experiment of the advanced Anunnaki race." The Anunnaki, which is a group of deities from ancient Mesopotamian cultures, are not a part of the Alien franchise. According to Vocativ, conspiracy theorists believe the Anunnaki were actually aliens who live on Nibiru, or Planet X, and engineered the human race. Jones claims in the video that, similar to how the alien race of "Alien: Covenant" is creating new organisms through bio-engineering, globalists on earth are modifying organisms through GMOs. "We are being sacrificed in this huge experiment," he said. "There are thousands of studies in the last 20 years admitting that GMO crops and GMO vaccines in other systems are purposefully changing our DNA and mutating us." A wild theory is not unusual for Jones, who says that most American tragedies, notably the September 11 attacks and the Sandy Hook Elementary School shooting, were orchestrated by the U.S. government to take away our freedoms. Over the course of the presidential election, Jones went from an angry conspiracist to a seriously influential political voice in favor of Donald Trump. According to Select All, Jones has spent less time recently warning of the New World Order and more time trying to take down the mainstream media by calling it "fake news." The president-elect appeared on his show in December 2015, and he told Jones,"Your reputation is amazing. I will not let you down." Both Hillary Clinton and Barack Obama mentioned Jones during campaign speeches -- notably when the president sniffed himself to prove to the audience that he is not a demon, as Jones suggested. Jones lost radical followers after distancing himself from the Pizzagate investigation, but according to Vocativ, he's gained some back following the "Alien: Covenant" video.